As we turn the page into another calendar year, PolyMagic would like to thank all of our loyal customers for another great year. As we traveled around the Kansas City area servicing both residential and commercial locations, we developed relationships with so many of our customers. As we look into 2019, we are committed to providing the highest level of customer service and honesty out there. 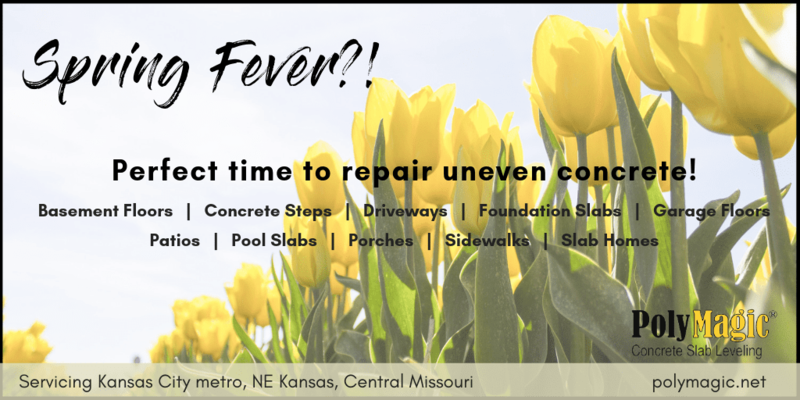 We encourage you to repair your uneven concrete with a company that is the highest google-rated company in the KC area. Are you ready to start on a free quote? Our new quote process allows you to upload a picture of your uneven surface, so we can more accurately provide a quote, and save you time! Get started here! 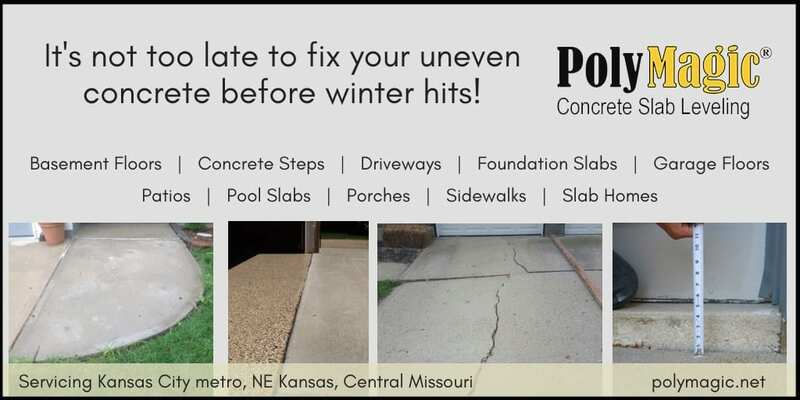 As the Midwest weather begins to change in preparation of colder temperatures, PolyMagic continues to see the correlation between cold weather and concrete repairs. Homes, apartment complexes, buildings, and businesses have concrete surfaces that are exposed to all weather elements, specifically cold weather. The exposure of varying temperatures and moisture can cause additional concrete cracking from frozen water expanding the pores of the concrete. As a result of the cyclical freezing and thawing of the rain, snow, and sleet rupturing concrete is very common in the Kansas City area. Another factor to consider when looking at Cold Weather and Concrete Repairs is that Midwestern winters can bring ice, which is commonly combated with de-icing chemicals. The chemicals can cause concrete to flake and break off into chunks. The concrete crumbling can worsen uneven concrete and tripping hazards. Many areas of Kansas City homes and businesses can be affected by the settlement and shifting, including driveways, sidewalks, garage floors, steps, basements, pool slabs, foundation slabs, and more. 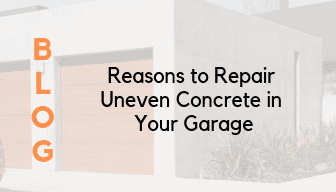 There are many concrete repair companies within the Kansas City area, but not all specialize in polyjacking ,which is a process of injecting high-density polyurethane foam into the concrete. This is a more cost-effective solution compared to mudjacking, and can have many additional benefits. Continue reading about the main differences in mudjacking vs polyjacking. Polyjacking, or poly leveling, is the most effective form of concrete repair. The key to polyjacking is to do your research on companies that are reputable, honest, and experienced. When someone needs an area of concrete repaired, it’s important to know the main differences in mudjacking vs. polyjacking, so you can speak and understand the lingo. When determining the most effective method of repairing concrete, trust the experts. Not all concrete repair companies are created equal, so it’s important to rely on an experienced company, like Kansas City area’s PolyMagic. See the below illustration demonstrating the difference between the sheer volume needed to repair the same area when using mudjacking vs. polyjacking. 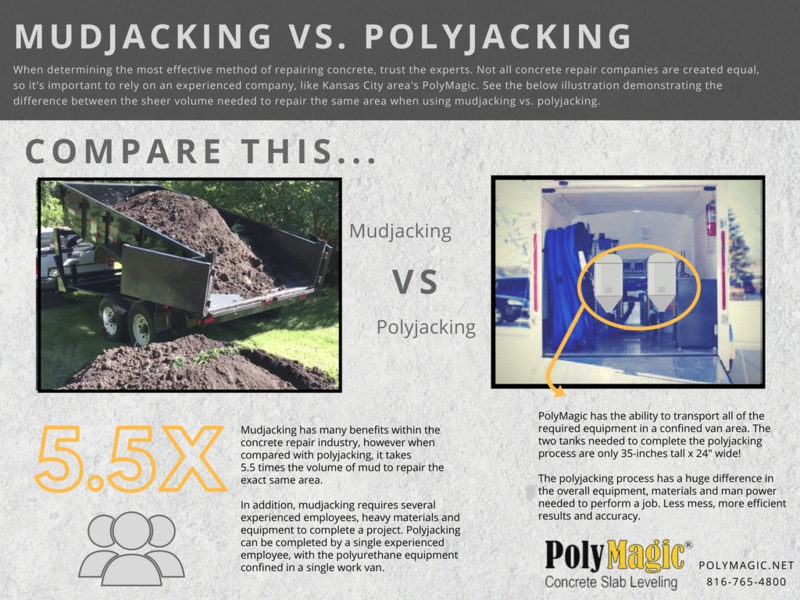 Mudjacking has many benefits within the concrete repair industry, however when compared with polyjacking, one of the main differences in mudjacking vs. polyjacking is that mudjacking takes 5.5 times the volume of mud to repair the exact same area when using poly. Here’s a recent article with additional differences in mudjacking and polyjacking, which you may find helpful. In addition, mudjacking requires several experienced employees, heavy materials and equipment to complete a project. Polyjacking can be completed by a single experienced employee, with the polyurethane equipment confined in a single work van. PolyMagic has the ability to transport all of the required equipment in a confined Ford transit van. The two tanks needed to complete the polyjacking process are only 35-inches tall x 24″ wide! The polyjacking process has a huge difference in the overall equipment, materials and man power needed to perform a job. Less mess, more efficient results and accuracy. We hope you understand some of the main differences in mudjacking vs. polyjacking when it comes to your next concrete project needing repair. If you have any questions, reach out to the Kansas City leading experts in the industry, PolyMagic – 816-765-4800. Are you ready to get a quick quote on repairing concrete stairs, or other projects? Submit your information, upload a photo of the project, and we’ll be in touch ASAP! (1): Lighter: Polyurethane injections are much lighter than the grout mixture used in mudjacking. (2) Reliability: The extra weight of the mud may cause the soil to settle causing a return trip to readjust the slab. As the leading concrete lifting company in Kansas City, explore these top benefits of polyjacking. 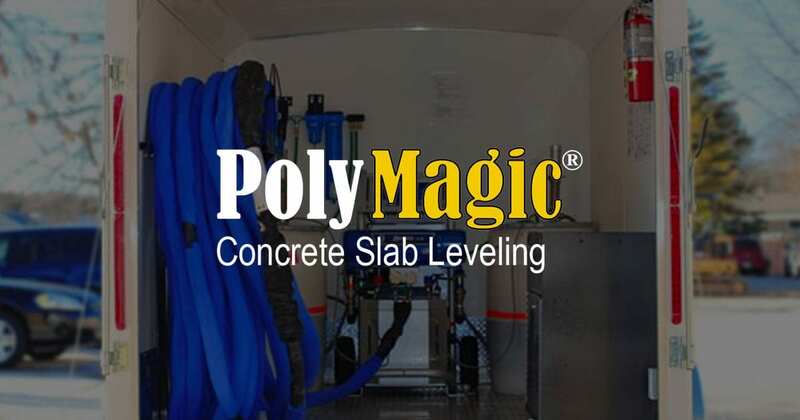 PolyMagic® is the Kansas City area leader in mudjacking, polyjacking, concrete leveling, and void filling. 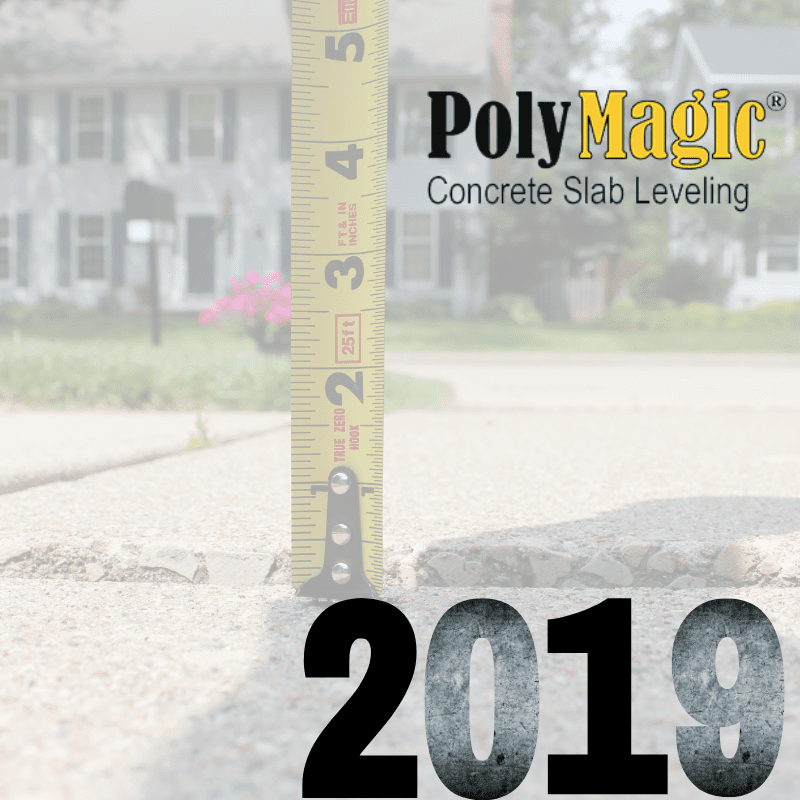 PolyMagic® offers a quick and affordable solution to sinking concrete slabs, allowing surfaces to remain safe and sturdy. With decades of experience, give Vince a call for an estimate on your next project!